Kona is the top freediving destination in the United States. You don't have to travel very far offshore to be in the deep clear blue waters where we test the limit of your depths. Swim through archways, explore lava tubes, and be closer to wildlife than ever before. As a Kona Freediver you can board our custom dive platform the Honu One for a day of epic freediving. 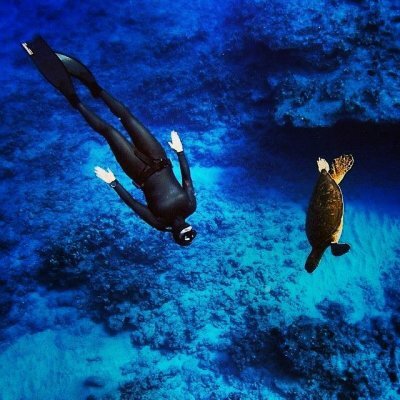 Our Professional Freediving Instructors and Coaches will guide you over reefs, safety your dives, give you technique tips and reminders, and point out some of Kona's unique wildlife. What is included: We provide a professional freediving instructor as a guide, weights, fresh fruit, snacks, and a fun day exploring the beautiful blue waters off the Kona Coast.